It might seem amusing to state one’s religion as ‘Jedi Knight’, ‘Lesbian Church’, ‘Warlock’ or ‘Revolutionary Army of the Baby Jesus’ in Question 19 on the National Census forms tonight, but the census is also a historical and genealogical goldmine of family information for future generations. We owe it to our great-great grandchildren to say ‘yes’ to Question 60 tonight to have our information kept by the National Archives and released after 99 years. They have a right to know their heritage, writes history editor Dr Glenn Davies. Tonight is Census Night when Australians have an opportunity to ensure their story is preserved in our national history for generations to come. The Census of Population and Housing comes around every five years and is an opportunity for the Australian Government, through the Australian Bureau of Statistics, to obtain information that is vital to planning for the future. This is the 16th Australian Census and marks 100 years of national census-taking in Australia and will cost about $440 million. It is also the largest peace-time operation ever conducted in Australia. The option for Australians to have their information preserved by the National Archives was first introduced in the 2001 Census, when 52 % of respondents answered 'Yes'. More than 56 % of people answered 'Yes' in the 2006 Census. 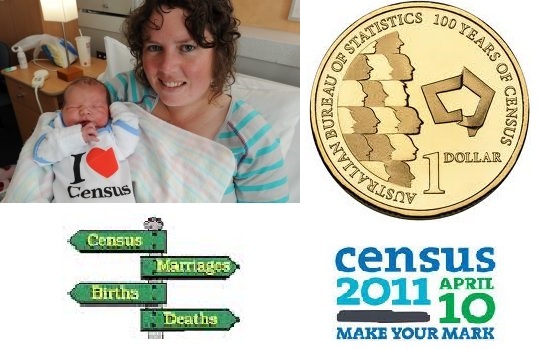 The goal in 2011 Census is to increase the ‘Yes’ rate to Question 60 to more than 60%. When you tick 'Yes' to Question 60 on your Census form, you are allowing the National Archives to preserve information on microfilm in a 'time capsule' for 99 years. The information will then be made available in 2110 for family historians and researchers in the next century. The ‘time capsule’ is an opportunity for you to be remembered forever. That is, your personal information will, in 99 years time, become a valuable resource for future generations, and will provide researchers, genealogists and historians with a complete picture of the year that was 2011. Australians can rest assured their records are kept safe, with census information held in high-security vaults across a variety of locations within the National Archives. The information cannot be accessed by any other government agency, including police or taxation, until the 99-year closed period expires and the records become public. In 2100, the films of the 2001 census will be released to the public. In 2105, the films of the 2006 census will be released. And in 2110, the films of the 2011 census will be released. Along with the films, the National Archives has created name and address indexes so the information will be easy to find. As the only public record that comes close to recording the name, address and occupation of every Australian, census information is an invaluable record of Australian family history. For researchers of the 22nd century, information in the ‘time capsule’ will be invaluable. If you have ticked 'Yes', you will be appreciated next century, by anyone who wants or needs the information – genealogists, historians, journalists, geographers, sociologists, epidemiologists and ... your descendants! I hope you will consider electing to have your Australian Census information stored in the ‘time capsule’ by the National Archives of Australia. Say ‘Yes’ to Question 60. It’s your chance to be remembered.